Home Board index "Us Alone"
"Heroes voice after the phone." Who is PHD referring to when he says this? Re: "Heroes voice after the phone." My guess would be Neil Young. It is known Hayden is a fan of Neil Young and below some "evidence" that would support this reference is to Neil Young. Hayden released an independent cassette, In September, in 1994, and followed with the album Everything I Long For in 1995. Released on his own Hardwood Records with distribution by Sonic Unyon, the album was a commercial success. He subsequently found himself in a bidding war between record labels in the United States, with one early offer coming directly from Neil Young, whose manager Elliott Roberts had just launched Vapor Records. I always assumed that it was when Neil invited Hayden to play the Bridge School Benefit in '96. 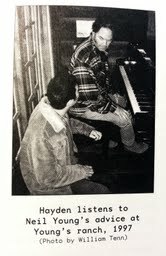 I snapped a photo from the book of Hayden meeting with Neil in '97. Thanks for the photo. I read the first edition a few years ago, but I don't remember that picture of Neil and Hayden. Very cool!